The kitchen cabinets you choose will make a huge difference in the way your kitchen looks and operates. Cabinets aren’t simply a place to store things; they can provide other functionality as well. We cannot stress the importance of choosing the perfect kitchen cabinets strongly enough. We’ve put together a series of questions that will help you make the best possible choice for your cabinetry. What overall functionality do you need from your cabinetry? A smart car can’t do a job that requires a pickup truck. Your cabinetry needs to be designed around the functionality you require. Do you prefer stock, semi-custom, or fully custom cabinets? Stock cabinetry is sold from your local home improvement store. They’re sitting on the shelf and ready to be picked up whenever you’re ready to use them. You can choose from finished or unfinished wood, so they can be somewhat customized as far as stain and finish. 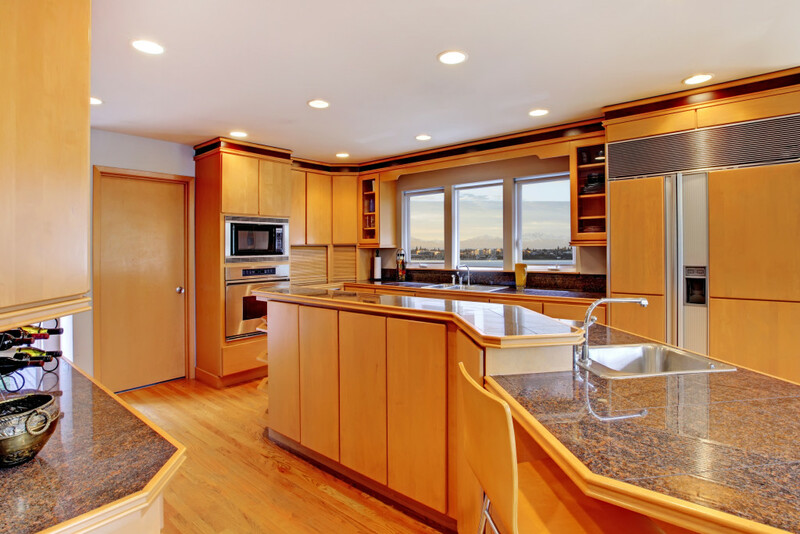 Semi-custom cabinetry is generally available at a more specialized kitchen supply store, and fully custom cabinets are built on request because they’re made to order. How do you plan to stay within budget for your entire remodeling project? Cabinets eat up a large portion of every kitchen remodeling project. The cabinets you choose will ultimately dictate other material types you can use without going over budget. We recommend going into the project with a plan and the understanding that if you splurge in one area you have to take away from another area. Let’s say you want fully custom cabinetry, opt for a butcher block or solid surface countertop instead of granite, quartz, or marble. Are custom cabinets practical? This depends entirely on how you use your kitchen and what you will use your cabinets for – refer to our first question. As we stated above, a smart car can’t do a job that requires a pickup truck. Standard cabinetry is a series of boxes with stationary shelves. You are the only person who can decide whether or not custom cabinetry is right for you. How do you decide? Custom cabinetry, semi-custom, stock, open shelving, or some combination of all…? We understand that these are difficult decisions to make and we will help you as much as possible. But the ultimate decision is yours and yours alone. Your entire kitchen should reflect your personality, lifestyle, and the way you use your kitchen. Everyone cooks at some point, but not everyone cooks exactly like you do. Tri-Lite Builders is located in Phoenix and we provide custom design, building, and remodeling services to greater Phoenix area homeowners. We enjoy the looks on homeowners’ faces when we reveal the remodeled kitchen and we’ve met every challenge with grace and beauty. Give us a call at 480-895-3442 if you would like to schedule an appointment for a consultation for your upcoming custom kitchen remodeling project.